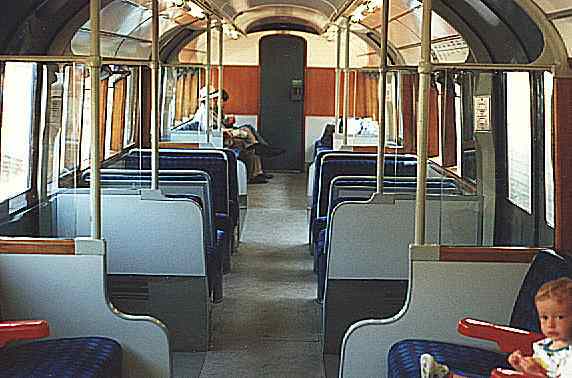 Due mainly to the limited clearance of the tunnel at Ryde, standard carriage stock is not suitable for use on the Island's railways. 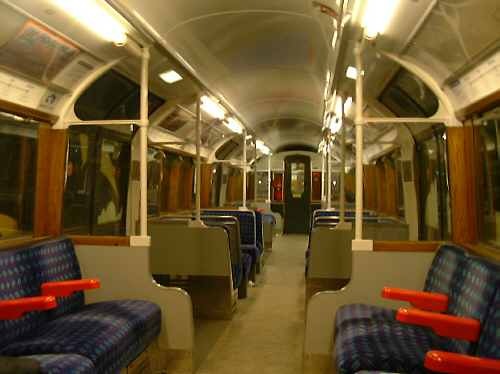 The cunning solution was to employ old London Underground trains which fitted the tunnel. 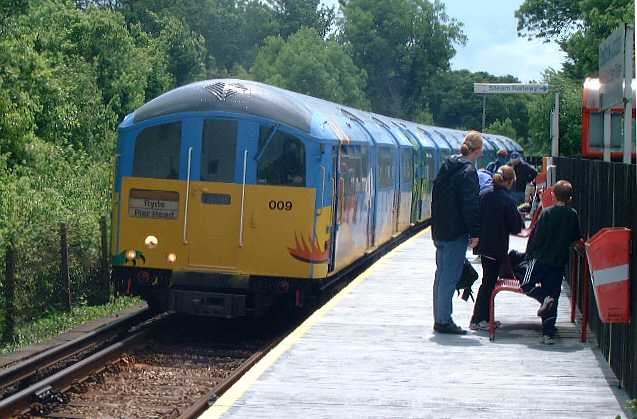 The trains in use until recently were vintage 1928. 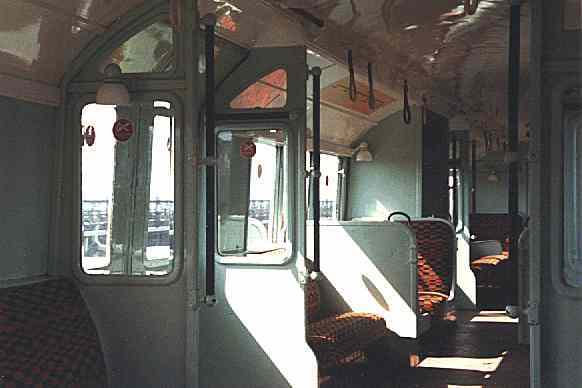 This is the inside of one of the 1928 carriages. The pier has a station at each end - It is about a quarter of a mile long. There is something unreal about travelling by train only feet above the waves! Click here to hear the train on the pier! 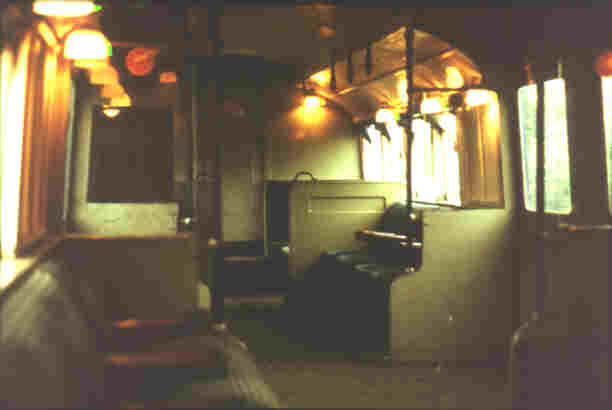 A 1928 carriage with lights on for the tunnel. Vintage 1928 pulling into Ryde Esplanade station. 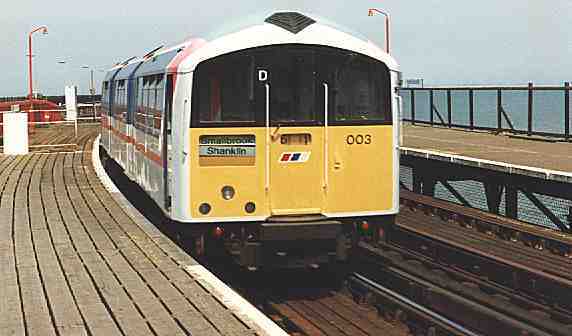 This train is seen at Shanklin station. Modernisation has to some extent spoilt the character of the island's railway. 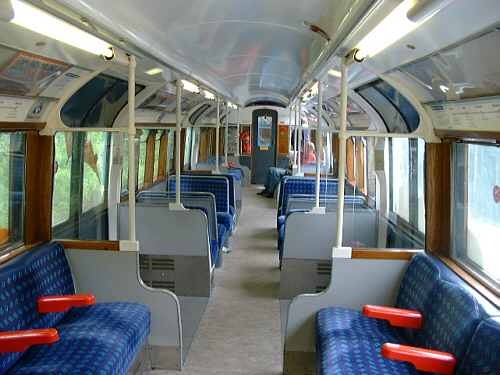 The 1928 trains have been replaced with more up-to-date 1938 ex-London Underground stock! The inside is now much brighter. 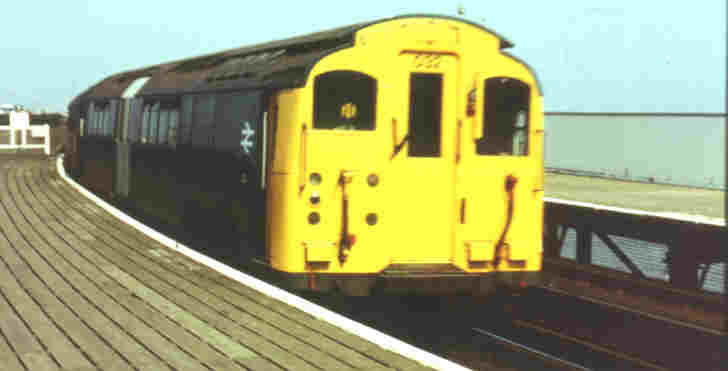 This 1938 train is seen approaching Ryde esplanade station along the pier. For many years most people entered the island using the ferry and pier railway. Now the majority use one of the three vehicle ferry routes. 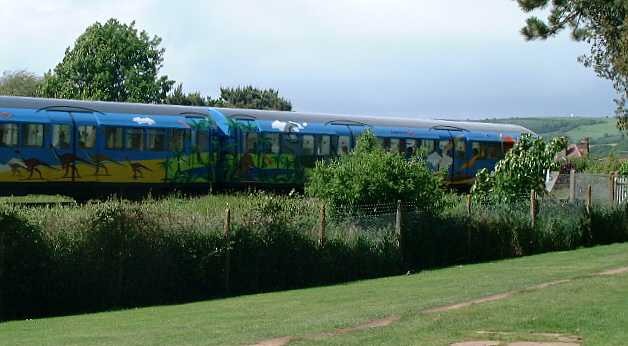 This train has been painted in dinosaur livery for 2000 and is very popular with the children. This view is from Los Altos park between Sandown & Lake. Another view from Los Altos park between Sandown & Lake. 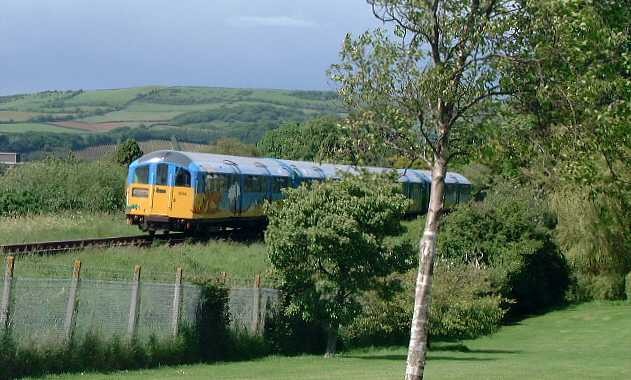 The Island's electric trains connect with the Havenstreet steam railway here at Smallbrook Junction. The spot where this photo was taken used to be a signal box. The line split here with one section going to Ventnor (now only as far as Shanklin) and the other to Newport & Cowes (now only to Wootton). 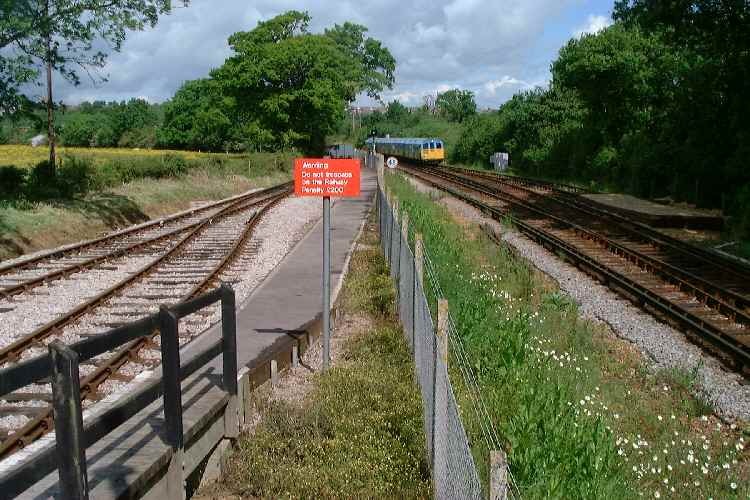 In the winter when the line was quiet this section to Ryde was run as two single lines and the signal box taken out of service. 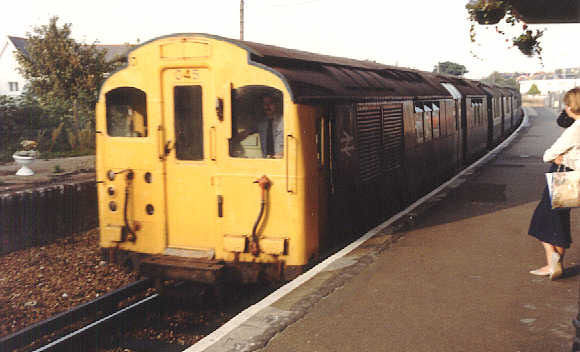 Trains from Ryde would often race to the signal box! In the summer the line would be run as a double track (as today). The signal box was probably the most photographed box anywhere in England. The spot was and still is very peaceful once the trains depart. Smallbrook again this time looking South.